1. Battleborn: If you’ve been attending any of the video game conventions in the past year or so, no doubt you’ve already seen the boldly lit Battleborn themed statues dominating the 2K Games floor space. This year they brought them back and they’re as jaw-dropping to look at as ever. With the release date of Battleborn approaching, it’s unlikely these stunners will make their way to E3 2016, but west coasters may get a chance during PAX Prime. 2. The Behemoth: It simply isn’t a PAX show without a visit to The Behemoth's booth. For years now they’ve been one of the best places to stop off during a show. With several stations showcasing The Behemoth's roster, from their Alien Hominid origins to the upcoming Pit People, it’s a place not only to check out the latest from the idiosyncratic studio but also experience their growing line-up of fun, well-designed, and visually charming games. Their always-welcoming and friendly staff also make it a great place to bring kids. 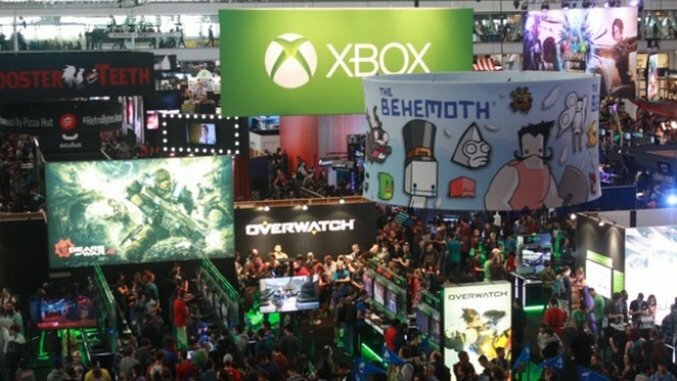 If you come to conventions to play games, The Behemoth's booth is a must-see. 3. ARK: Survival Evolved: Of the many things I’ve seen on video game conventions over the years, I must say this is one of the more impressive. The last time I saw a giant dinosaur on the show floor, it was the Dinky statue from Fallout: New Vegas in 2010. Only that dinosaur wasn’t rideable, and this 16 foot T Rex promoting ARK: Survival Evolved is. It’s a fun game that doesn’t need gimmicky promotions, but as far as gimmicky promotions go, I approve. Oh, I approve so hard. 4. Monster Hunter: The better booths at PAX are always the ones that give you something to look at. This giant blimp, celebrating Monster Hunter Generations, was among the most dominating sights upon entering the show floor. 5. DOOM: The DOOM booth is amazing because, well first, it’s DOOM, second, you get to play DOOM, third, all the DOOM related artifacts, fourth...MOOD LIGHTING. As with previous shows, the DOOM booth had the Revenant statue on display for fans to pose with, making this among the better places for fans to stop by and get a snapshot for their PAX East scrapbooks. The demo stations also loomed in the magnificent shadow of some intense DOOM art, while the BFG 9000 once again lurked on display nearby. The dust from PAX East 2016 has settled. However the sights remain. This year the Boston Convention and Exhibition Center was once again graced with the bright lights and banners of dozens upon dozens of video game publishers and developers promoting their upcoming and current releases, offering fans and media a hands-on experience from the comfort of their stylish, over-the-top booths. Here are some of the best we saw over the course of the event, highlighting the most gorgeous and entertaining displays of the convention.